Adam Peaty won his fourth title of the European Championships and Ben Proud clinched the 50m freestyle crown as Great Britain won seven medals on the final day of swimming action. GB's swimmers finished with nine golds and 24 medals in total to match their previous best haul in Berlin 2014. Peaty produced a superb breaststroke leg to lead the men's 4x100m individual relay team to victory. Proud won his first European title with gold in the men's 50m freestyle. The 23-year-old Commonwealth champion held off Greek Kristian Gkolomeev, who was closing in the final metres, to touch home in 21.34 seconds. Britain's Imogen Clark won silver, behind Russia's Yulia Efimova in the women's 50m breaststroke. There were also British bronze medals for James Guy, in the men's 100m butterfly final, Holly Hibbott, in the 400m freestyle and for the women's 4x100m team, made up of Georgia Davies, Siobhan Marie O Connor, Alys Thomas and Freya Anderson. Britain have now won 18 gold medals at these inaugural multi-sport championships, which includes Jack Laugher's victory in the men's 3m springboard earlier on Thursday. 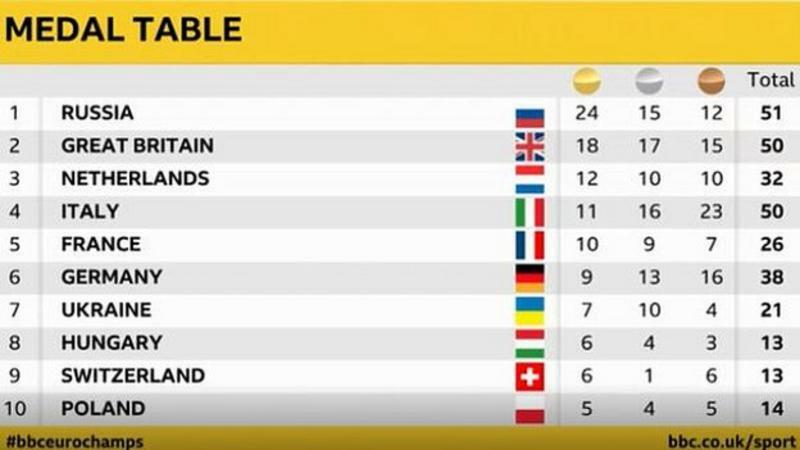 Peaty won his 12th European title as the men's 4x100m quartet - which included Nicholas Pyle, Guy and 200m freestyle champion Duncan Scott - beat Russia to the title. Peaty, who also won the 50m and 100m breaststroke and 4x100m mixed medley, told BBC Sport: "The crowd got going and I knew I just had to hold my ground and get it back to these guys. "A massive shout to Nicholas who stepped up - hopefully in two years time he'll have the maturity and a bit more muscle." Proud, who also won silver in the 50m butterfly, told BBC Sport: "I'm happy with that and to come away with the gold. "I'm grateful to everyone who I've worked with so far and now it's all about being ready for two years' time [for the Tokyo Olympics]." Meanwhile, 19-year-old Clark said Proud's achievement gave her added impetus before her race. "It's absolutely mad, I can't believe it," said the swimmer, who trains at Loughborough University. "I was lifted by Proud's gold - it leaves you all tingly. I just wanted to go after I heard that roar for him." The teenager added that she was now focused on 100m breaststroke because the 50m is not an Olympic discipline. Efimova's victory meant she had completed the breaststroke treble at these championships, having won the 100m and 200m events. Guy (51.42 secs) was beaten to gold by Italy's Piero Codia, who set a championships record of 50.64 secs from lane eight, with France's Mehdy Metella (51.24 secs) third. Earlier in the day, double Olympic medallist Jazz Carlin came 14th in the open water 10k, with Alice Dearing and Danielle Huskisson in 12th and 15th. Jack Burnell finished seventh in the men's event and Tobias Robinson ninth. 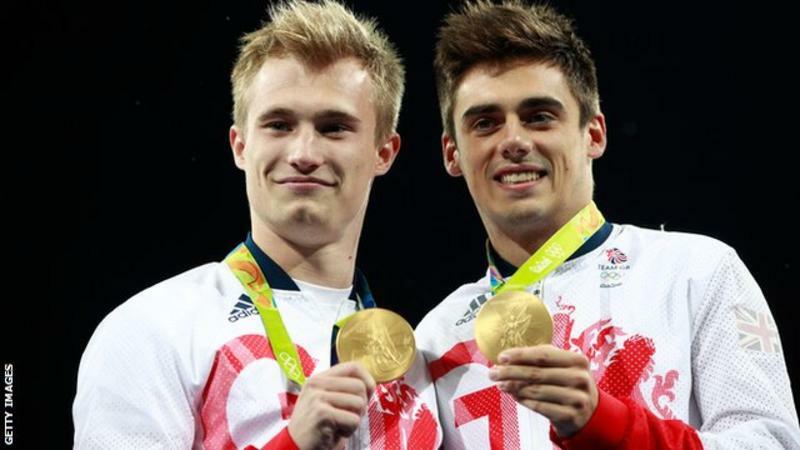 Gold medals: 12 in diving, triathlon and athletics. 13.30 - Jack Laugher will hope to win his third gold of these European Championships, in the synchro 3m springboard. He won the 2016 Olympic and 2018 Commonwealth titles with partner Chris Mears. 16:00 - Olympic champion Alistair Brownlee is aiming for his fourth European men's triathlon title, although he has endured an injury-hot season. 19.20 - Commonwealth champion Katarina Johnson-Thompson leads the heptathlon after day one and will be hoping to keep Belgium's Olympic and world champion Nafi Thiam at bay. 20:05- Matt Hudson-Smith goes in the final of the men's 400m - he is the fastest man in the field this year. 20:20 - Two-time champion Lynsey Sharp, Shelayna Oskan-Clarke and Adelle Tracey will battle for medals in the women's 800m final. 20:35 - Andrew Pozzi will attempt to add the outdoor European 110m hurdles title to the world indoor crown he won in Birmingham in March. Live coverage: 09:00-13:45, BBC Two; 13:45-17:15, BBC One; 17:15-21:00, BBC Two, with further coverage on BBC Red Button, Connected TV and online throughout and Radio 5 live sports extra commentary from 19:00.